We visited Latvia a few years ago and remember hearty food based around pork and potato, covered in sour cream and dill. 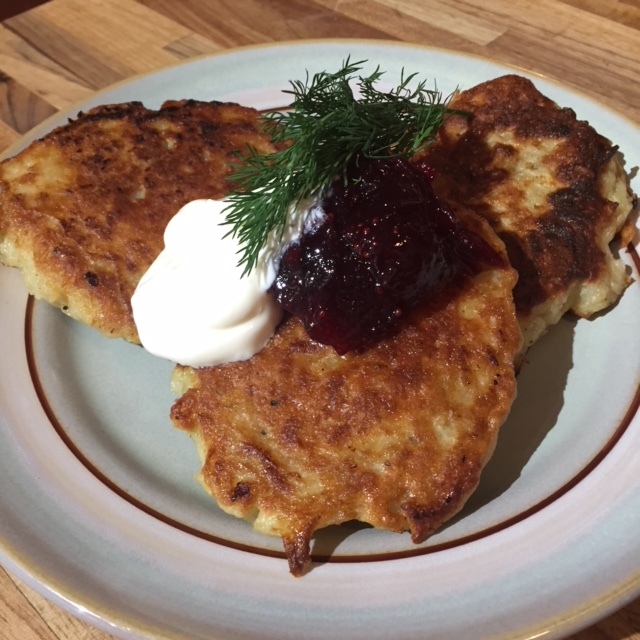 For our Latvian meals I settled on Kartupeju pankukas (potato pancakes) and Ceptas kartupeju pelmeni (pan fried potato dumplings) using two recipes I found online. The potato pancakes were the easiest to make: 600g of grated raw potato, 1 egg, 5 tbsp flour and seasoning, mixed together and fried. These were ok but perhaps a bit dense. To make the dumpling wrappers you mix mashed (cooked) potato with grated raw potato, sour cream, egg, salt and pepper and mix together to form a dough. The filling is made from fried onion and bacon. You then parcel up a bit of the bacon mix inside the wrapper and form into a torpedo shape. The dumplings are boiled for about 10 minutes then pan fried in butter. These were absolutely delicious! I’m so glad you liked my potoato dumpling recipe. They are a little fiddly, but fry anything in butter and it is a winner! What a great Latvian feast you prepared.